Once again, a website has determined the Inland Empire is a wasteland for foodies. As you may recall, back in 2013, the real estate site Movoto posted on its blog — known for its myriad “top ten” lists — a list of “America’s Worst Cities for Food Lovers,” based on such criteria as food trucks, ice cream shops, caterers and gourmet grocers per capita. Guess what? San Bernardino was at the top of that list. Surprise! San Bernardino wasn’t at the bottom of the list. That distinction goes to another Inland Empire city: Moreno Valley. However, San Bernardino didn’t rise too far from the bottom, ranking number 137. 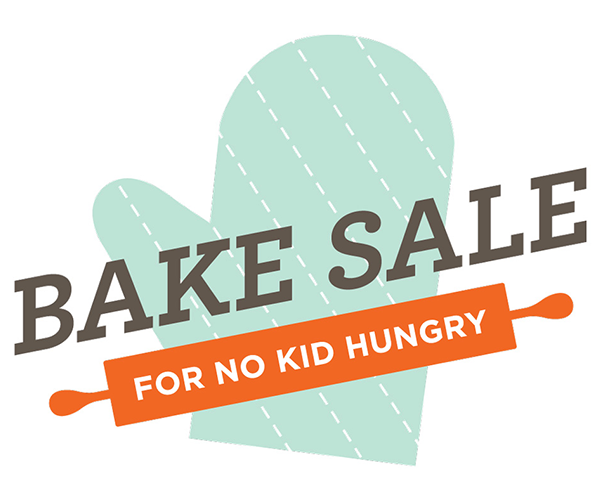 Sunday (October 25) is your chance to get some sweet treats for yourself and help end childhood hunger at the same time. 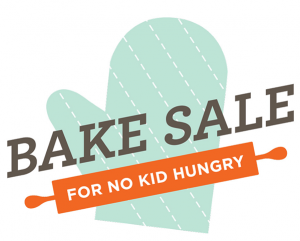 That’s because it’s the return of the Redlands Bake Sale for No Kid Hungry. This year, there will be a change versus previous outings. Instead of a separate event held in the spring, the organizers have joined with the Downtown Redlands Art Walk. The event is set for noon to 6 p.m. at various businesses in the downtown area. 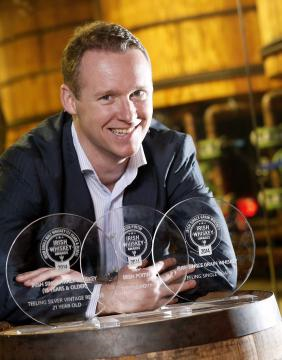 Jack Teeling, chosen as “World’s Best Global Whisky Ambassador” at this year’s World Whiskies Awards is coming to the Inland Empire. He’ll be paying a visit to Vom Fass Claremont next week. Teelings’s family has been producing Irish Whiskey since 1782. Jack will be busy while he’s here, hosting a whiskey class on the 25th, deciding who the Inland Empire’s best bartender is on the 26th and greeting the public on the 25th and 27th. The bad news is that these events are booked solid. The good news is that the owners of Vom Fass Claremont are committed to squeezing as many people into the public meet and greet sessions as possible. Inland Empire Restaurant Week is back again! The 10-day celebration of local restaurants begins today (October 16) and runs through October 25. The concept is simple: Participating restaurants are offering specially-priced prix fixe lunch and dinner deals to entice diners. Prices range from $10 to $20 for lunch and from $20 to $30 for dinner. Many people look forward to Halloween every year. For a lot of people, it’s their favorite holiday. They like the decorating, the dressing up and all the rest of the spooky fun. 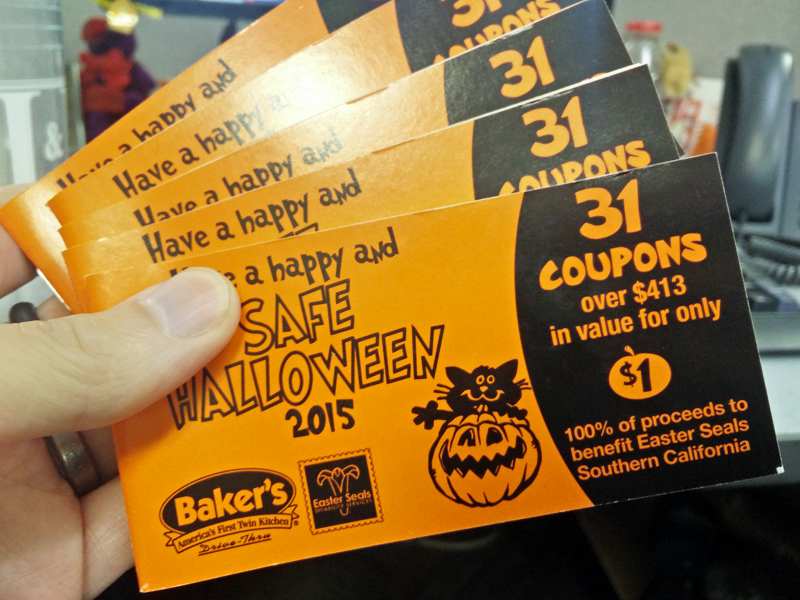 We look forward to Halloween because it means the return of one of our favorite fundraisers: Baker’s Drive-Thru Safe Halloween coupon books. Each coupon book only costs a dollar, but contains coupons worth hundreds of dollars. 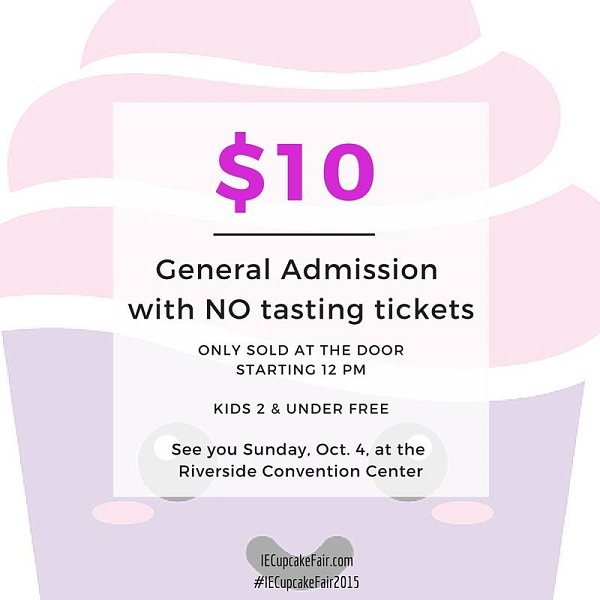 Are you ready to sip, snack and shop, all while supporting the Chino Hills community? 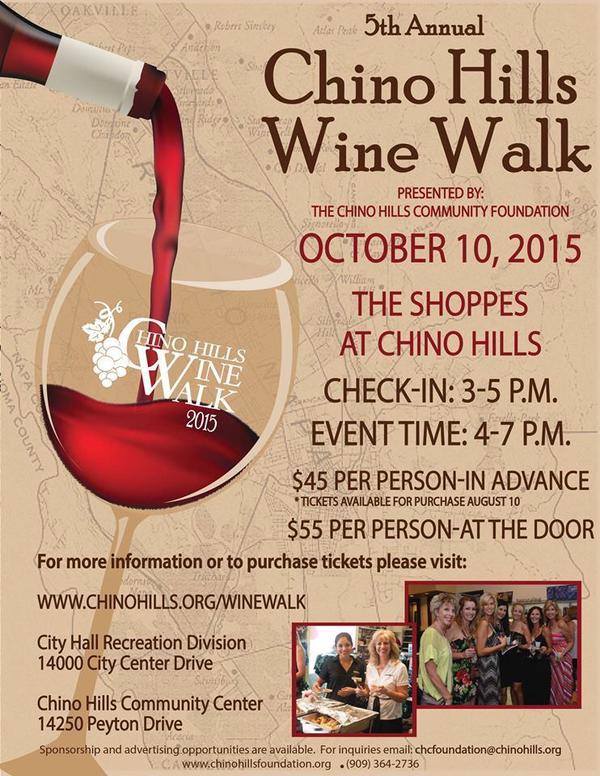 The fifth annual Chino Hills Wine Walk will take place from 4 to 7 p.m. tomorrow evening (October 10) at The Shoppes at Chino Hills. Proceeds from the event will help the Chino Hills Community Foundation’s cause to supplement funding for cultural, educational and recreational projects in the city where funding is insufficient or unavailable. 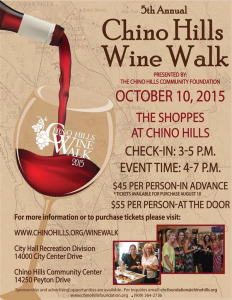 20 wines and appetizers will be featured at participating retailers at The Shoppes at Chino Hills. 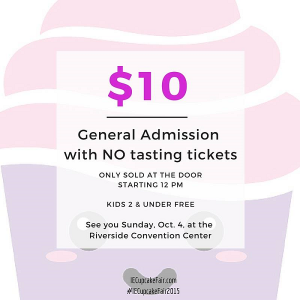 Although tasting tickets have sold out for today’s (October 4) Inland Empire Cupcake Fair & Baking Expo, you can still go. General admission tickets — which do not include tasting tickets — will be available for $10 at the door, beginning at noon. Food trucks will again be part of this year’s Rah Rah Redlands at the University of Redlands’ Ted Runner Stadium. The homecoming tailgating event, which is open to the public, runs until 8:30 p.m., with the football game kicking off at 7 p.m., tonight (October 3). Adult admission, which includes the football game, is $10. Kids 4 to 12 get in for $5. U of R students and kids 3 and younger get in free. A family pass — good for two adults and up to four kids — is $35.